Blane De St. Croix, an artist and associate professor of sculpture at Florida Atlantic University in Boca Raton, has accepted a 2011 Massachusetts College of Art Alumni Award for Outstanding Accomplishment. Daniel Eisenberg, professor in the Department of Film, Video, New Media, and Animation at the School of the Art Institute of Chicago in Illinois, has been awarded a film/video grant from Creative Capital to help fund The Unstable Object, a film that will address the relationship between factory workers and the objects they produce. Malik Gaines, a member of the artist collective My Barbarian, has received a grant in visual arts from Creative Capital in support of a series of workshops and public performances, titled Post-Living Ante-Action Theater. His group will collaborate with artists working in Israel and Egypt to stage visual, musical, and theatrical demonstrations. Ken Gonzales-Day had been awarded a visual-arts grant from Creative Capital in support of Profiled, an ongoing project that uncovers racial stereotypes from the seventeenth and eighteenth centuries. Gonzales-Day will use the grant to produce a series of workshops with middle school students in central Los Angeles that will explore themes of racial and ethnographic categorization in art viewing and making. Julie Green, an artist and associate professor of art at Oregon State University in Corvallis, has received a 2011 Joan Mitchell Foundation Award for Painters and Sculptors. Green is one of twenty-five artists nationwide to receive the award. Natilee Harren, a doctoral candidate in the Department of Art History at the University of California, Los Angeles, is cowinner of the first Art & Education Paper Prize. Harren’s text, “Objects without Objects: The Artwork in Flux,” has been published in Art & Education Papers. Jane McFadden, associate professor of art and design at Art Center College of Design in Pasadena, California, had received a grant through the Arts Writers Grant Program, a collaboration between Creative Capital and the Andy Warhol Foundation for the Visual Arts, in support of her forthcoming book, There and Not There: Walter De Maria. Christine Mehring, associate professor of art history at the University of Chicago in Illinois, has accepted an award from the Arts Writers Grant Program, administered by Creative Capital and the Andy Warhol Foundation for the Visual Arts, that will support her forthcoming book, Munich ‘72: Olympian Art and Architecture. Written in collaboration with Sean Keller, Munich ’72 will examine the lost history of the art and architecture of the 1972 Olympics and its lasting effects on the global art world and the construction on German postwar identity. Melissa Potter, assistant professor of interdisciplinary arts at Columbia College Chicago in Illinois, has received a faculty development grant to help produce a collaboration with a fellow artist and faculty member, Paul Catanese. Their project, Handmade Media, explores the intersection of electronic media and hand papermaking. Emily Eliza Scott, an independent artist and scholar, has earned a grant from the Arts Writers Grant Program, administered by Creative Capital and the Andy Warhol Foundation for the Visual Arts. The award will support her forthcoming article, “Toxic Gardens: Patricia Johanson’s House and Garden Proposal (1969),” which addresses Patricia Johanson’s radical proposals for New York City parks in the late 1960s and their relationship to Land art, Minimalism, and an emergent ecologically conscious culture. Roger Shimomura, a painter and professor of art at the University of Kansas in Lawrence, has received a $50,000 United States Artists Fellowship. Shimomura is known for work that investigates Asian American identity and, more recently, Muslim American identity in a post–September 11 world. Deborah Stratman, a Chicago-based artist and filmmaker, has received a film/video grant from Creative Capital that will help fund her forthcoming film, The Illinois Parables, which explores a series of regional narratives while addressing themes of the rational, the supernatural, the political, and the mystical. Jesse Sugarmann, an interdisciplinary artist and assistant professor of new genres at California State University, Bakersfield, has received a film/video grant from Creative Capital in support of We Build Excitement, a film about the American automobile industry and the manufacturing of American identity. at the School of the Art Institute of Chicago in Illinois, has been awarded a Creative Capital grant in film/video to help produce The Orbit of Minor Satellites, his forthcoming animated feature. Meredith Tromble, an artist, writer, and associate professor at the San Francisco Art Institute in California, has earned a grant through the Arts Writers Grant Program, a collaborative venture between Creative Capital and the Andy Warhol Foundation for the Visual Arts, in support of her blog Art and Shadows, a platform to address contemporary art and its relationship to theories of mind and consciousness. Murtaza Vali, a writer, art historian, and curator based in Brooklyn, New York, has accepted a grant for short-form writing through Creative Capital and the Andy Warhol Foundation for the Visual Arts’ Arts collaborative initiative, the Arts Writers Grant Program. Throughout the year Vali will produce critical writing that addresses figures of absence and presence in contemporary political art. William Wilson has been recognized with a grant from the Arts Writers Grant Program, administered by Creative Capital and the Andy Warhol Foundation for the Visual Arts. The funds will help support Ray Johnson: An Illustrated Life in Art, a book that will examine Johnson’s life and work in the context of an extensive personal archive housed in Wilson’s home. Colin B. Baily. Renoir, Impressionism, and Full Length Painting. Frick Collection, New York, February 7–May 13, 2012. Patricia G. Berman. Luminous Modernism. Scandinavia House, New York, October 25, 2011–February 11, 2012. Jeanne Brasile. Jones and Roa: Pulvis et Umbra. Cuchifritos Art Gallery/Project Space, New York, November 12–December 18, 2011. Reni Gower. Papercuts. Norman Shannon and Emmy Lou P. Illges Gallery, Columbus State University, Columbus, Georgia, March 22–April 24, 2012. John Silvis. Walls and Light: Recent Photographs by Father Paul Anel. First Things Gallery, New York, November 10, 2011–January 9, 2012. Cortney Lane Stell. Jorrit Tornquist: The Intersection of Color and Thought. J. Phillip J Steele Gallery, Denver, Colorado, February 6–March 4, 2012. Thalia Vrachopoulos. Carol Jacobsen: Mistrial. Sixth Floor President’s Gallery, John Jay College of Criminal Justice, City University of New York, New York, October 17–December 16, 2011. Michael J. Waters and Cammy Brothers. Variety, Archeology, and Ornament: Renaissance Architectural Prints from Column to Cornice. University of Virginia Art Museum, Charlottesville, Virginia, August 26–December 18, 2011. Lili White. The Missing Third Festival Show. Another Experiment by Women Film Festival, Anthology Film Archives, New York. March 7, 2012. Jeffrey Abt. American Egyptologist: The Life of James Henry Breasted and the Creation of His Oriental Institute (Chicago: University of Chicago Press, 2011). Annette Blaugrund. Dispensing Beauty in New York and Beyond: The Triumph and Tragedies of Harriet Hubbard Ayer (Charleston, SC: History Press, 2011). Faya Causey. Amber and the Ancient World (Los Angeles: J. Paul Getty Museum, 2012). Cora Cohen. Cora Cohen: Works on Paper (Houston: D. M. Allison Editions, 2011). Jake Harvey, Joel Fisher, Jessica Harrison, and Noé Mendelle. Stone: A Legacy and Inspiration for Art (London: Black Dog Press, 2011). Bernard L. Herman, ed. Thornton Dial: Thoughts on Paper (Chapel Hill: University of North Carolina Press, in association with the Ackland Art Museum, 2012). Zoya Kocur, ed. Global Visual Cultures: An Anthology (Malden, MA: Wiley Blackwell, 2011). Aden Kumler. Translating Truth: Ambitious Images and Religious Knowledge in Late Medieval France and England (New Haven, CT: Yale University Press, 2011). Mary Patten. Revolution as an Eternal Dream: The Exemplary Failure of the Madame Binh Graphics Collective (Chicago: Half Letter Press, 2011). Nicolas Pearce and Jason Steuber, eds. Original Intentions: Essays on Production, Reproduction, and Interpretation in the Arts of China (Gainesville: University Press of Florida, 2012). Michael J. Waters and Cammy Brothers. Variety, Archeology, and Ornament: Renaissance Architectural Prints from Column to Cornice (Charlottesville: University of Virginia Art Museum, 2011). Please visit the website for the 100th Annual Conference in Los Angeles for complete details about obtaining access to wireless-internet connections at the Los Angeles Convention Center and the four conference hotels. The CWA Picks for February 2012 include four solo shows of women artists at museums and galleries across the United States. The Hammer Museum in Los Angeles, California, presents Alina Szapocznikow: Sculpture Undone, 1955–1972, and the Carnegie Museum of Art in Pittsburgh, Pennsylvania, will exhibit the work of Maya Lin. 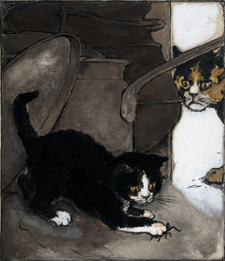 Kathryn Spence: Dirty and Clean is on view at the Aldrich Contemporary Art Museum in Ridgefield, Connecticut, and the Delaware Art Museum in Wilmington has organized a survey of work by the celebrated children’s book author and illustrator, Katharine Pyle (1863–1938). caa.reviews invites nominations and self-nominations for six individuals to join its Council of Field Editors, which commissions reviews within an area of expertise or geographic region, for a three-year term: July 1, 2012–June 30, 2015. 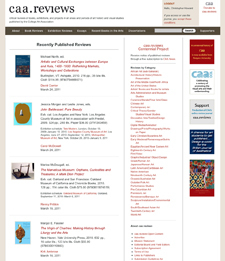 An online journal, caa.reviews is devoted to the peer review of new books, museum exhibitions, and projects relevant to art history, visual studies, and the arts. The journal seeks three field editors for books in contemporary art, Iberian and colonial Latin American art, and Precolumbian art. Two field editors are needed to commission reviews of exhibitions in the Midwest and Southeast, covering the art of all periods, and one field editor for exhibitions on the West Coast covering art before 1800. Candidates may be artists, art historians, critics, curators, or other professionals in the visual arts; institutional affiliation is not required. Working with the caa.reviews editor-in-chief, the caa.reviews Editorial Board, and CAA’s staff editor, each field editor selects content to be reviewed, commissions reviewers, and reviews manuscripts for publication. Field editors for books are expected to keep abreast of newly published and important books and related media in his or her field of expertise, and those for exhibitions should be aware of current and upcoming exhibitions (and other related projects) in their geographic regions. The Council of Field Editors meets annually at the CAA Annual Conference. Field editors must pay travel and lodging expenses to attend the conference. Candidates must be current CAA members and should not be serving on the editorial board of a competitive journal or on another CAA editorial board or committee. Nominators should ascertain their nominee’s willingness to serve before submitting a name; self-nominations are also welcome. Please send a statement describing your interest in and qualifications for appointment, a CV, and your contact information to: caa.reviews Editorial Board, College Art Association, 50 Broadway, 21st Floor, New York, NY 10004; or email the documents to Alyssa Pavley, CAA editorial assistant. Deadline: April 25, 2012. Updated on March 26, 2012. Alina Szapocznikow: Sculpture Undone, 1955–1972 is the inaugural United States museum survey for this underrepresented Polish artist. A Holocaust survivor who died in 1973 at the age of forty-seven, Szapocznikow is widely acknowledged by her artist peers as one of the most significant sculptors of the twentieth century. She pioneered the use of unconventional sculptural materials, such as polyester and polyurethane, and constructed a visual language that addressed the body’s pain and regeneration. The exhibition includes approximately sixty sculptures, fifty works on paper, and numerous photographic works, demonstrating the tremendous range of Szapocznikow’s vision and continuing influence on twentieth- and twenty-first-century artists. An exhibition of work by Maya Lin explores her diverse career as architect, artist, and dedicated environmentalist. The twenty-one sculptures and drawings on view range from room-sized installations evocative of geological topography to intricately designed wall installations. Lin has made one new work inspired by Pittsburgh’s three rivers, Pin River – Ohio (Allegheny & Monongahela), specifically for the Carnegie Museum, and her new memorial video project, What is Missing?, will be screened in the museum’s Scaife Lobby. This year’s Feminist Art Project Day of Panels, organized by the artists Audrey Chan and Elana Mann and held in conjunction with the CAA Annual Conference, asks the question: What are the stakes—and who are the stakeholders—of the feminist future? The conversations will address the greater inclusivity of a contemporary feminist art that embraces a multiplicity of identities and philosophies. Topics of discussion will include: feminist art educational models, the roles of men in feminist art, interventionist art strategies, radical queer art making, and feminism as a daily humanist practice. This event is free and open to the public. This exhibition presents seventy-one works by the celebrated children’s book author and illustrator Katharine Pyle (1863–1938). A native of Wilmington, Katherine Pyle was encouraged from a young age to pursue poetry and illustration by her older brother, the famed illustrator Howard Pyle. She studied at the Philadelphia School of Design for Women and at the Drexel Institute of Art and Science, also in Philadelphia. Her work was stylistically aligned with her brother, and also with Beatrix Potter, Walter Crane, and Aubrey Beardsley. Pyle’s subjects were taken from Norse and Greek mythology, fairy tales, and animal stories, and her 1923 illustrations for Anna Sewell’s novel Black Beauty are among her best-known work. This exhibition, curated by Martin Rosenberg and J. Susan Isaacs, looks at the current state of feminist art practices and the range of materials and theories used by contemporary artists. Personal and political identity is explored in painting, drawing, sculpture, photography, and needlework. The roster of artists include: Blanka Amezkua, Sarah Amos, Helene Aylon, Siona Benjamin, Zoe Charlton, Sonya Clark, Annet Couwenberg, Lalla A. Essaydi, Judy Gelles, Sharon Harper, Julie Harris, Fujiko Isomura, Tatiana Parcero, Philemona Williamson, April Wood, and Flo Oy Wong. The German-born, San Francisco-based artist Kathryn Spence uses found, dirty, and discarded materials to explore the complexities of humanity’s relationship to garbage and its place in our ecosystem. 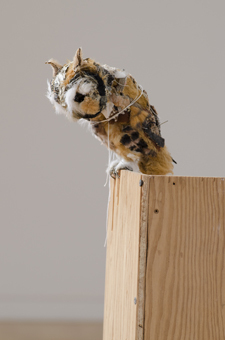 Spence, an avid bird-watcher and nature enthusiast, creates life-sized animal models from scraps of paper, fabric, string, and wire. Her work plays with the idea of dirt and dirtiness as both a purifying source and as a by-product of human waste and greed. The National Committee for the History of Art (NCHA) has awarded travel grants to fourteen PhD students at American universities to attend the thirty-third congress of the International Committee of the History of Art (Comité International d’Histoire de l’Art, or CIHA), taking place July 15–20, 2012, in Nuremberg, Germany. Each student’s department will match the NCHA funds. Nominated by their departments, the students were selected from among a much larger group of highly competitive nominees. The asterisk (*) indicates a current CAA member. NCHA is the American affiliate of the international community of art historians. Two representatives from CAA, usually the past presidents from the Board of Directors, are NCHA individual members. Both NCHA and CIHA aim to foster intellectual exchange among scholars, teachers, students, and others interested in art history broadly conceived as encompassing art, architecture, and visual culture across geographical boundaries and throughout history. Through the organization of scholarly conferences of varying size and scope, NCHA and CIHA promote the communication, dissemination, and exchange of knowledge and information about art history and related fields, ultimately seeking to promote a global community of art historians.